Penang remains a property hotspot with developers from both the island and the Klang Valley, with the number of new projects increasing in the third quarter of this year. Despite fears of a property bubble, notably in the condominium market, developers appear to be forging ahead with new and innovative launches on the island where foreign buyers are making a beeline for homes with a commanding view of the sea or hills. The new developments are scattered across the island and players include Eastern and Oriental Bhd (E&O), IJM Land Bhd, SP Setia Bhd, Mah Sing Group Bhd and the Penang-based Ivory Properties Group and MTT Properties and Development. These players have not only been marketing their projects to Malaysians but also in neighbouring countries and farther away, like South Korea and Great Britain. In a report titled "Pounding the Pavement in Penang" on November 5, CIMB expressed optimism over the outlook for landed residential property on the island, and even seafronting condominiums. "We believe residential property prices in Penang have appreciated strongly in recent years due to some short- to medium-term supply constraints and the influx of Klang Valley developers. "The high quality and exciting property products offered by these aggressive developers will not only attract upgraders from Penang but also buyers of holiday homes from Kuala Lumpur, Singapore and Hong Kong," the research firm said. If seafront condominiums on reclaimed land look to be the prime beneficiaries of robust demand, then IJM Land and E&O are set to do well with their projects. "We feel that the property market in Penang is still resilient as prices are lower when benchmarked against those for integrated developments in cities like Kuala Lumpur, Singapore and Bangkok," IJM Land managing director Datuk Soam Heng Choon said. "Also, the base lending rate is still low and some cash-rich investors are switching from the stock market to property." IJM Land's "The Light" waterfront project on reclaimed land along the Jelutong Expressway is an ambitious development set to raise the bar for property prices in the state. Phase 1, which sprawls over 16ha, comprises residential units and is expected to take six years to complete. The second phase will encompass 41.2ha and take 15 years to be developed. The gross development value of both phases is reported to be RM5.5 billion. "We are still optimistic about demand owing to the fact that 'The Light' is the only integrated waterfront development in Penang with iconic landmark buildings such as an information technology hub, promenade mall, seafront boardwalk, convention and exhibition centre, boutique hotel and marina club," Soam said. 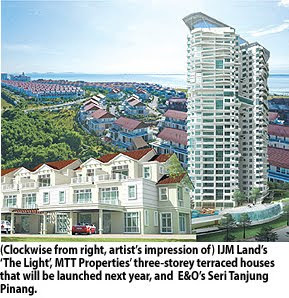 "For E&O, based on the positive take-up of our earlier properties and the registered interest in our upcoming launches, prospects of the property market in Penang are highly encouraging," its executive director Eric Chan Kok Leong said. From the time the company launched its first batch of terraced homes at its seafront reclaimed land till now, E&O has been seeing strong take-up for its "Seri Tanjung Pinang" offerings, he added. Located about 15 minutes from George Town, the mixed residential and commercial project features two phases over a development period of between 15 years and 20 years. Seri Tanjung Pinang's Ariza Seafront Terraces and Serviced Residences achieved at least 80 per cent take-up within a few weeks of their soft launch, its developer said. "In fact, all 33 units of the Ariza Seafront Terraces were sold within a mere three hours of launch. "What's more, a balloting system had to be put in place for the four units with direct sea frontage," Chan added. On the southwestern tip of the island, SP Setia's maiden and flagship project in Penang is the 45.2ha "Setia Pearl Island". The former golf course land has been substantially developed and SP Setia has sold an estimated RM500 million worth of properties since the initial launch two to three years ago. "As a keen proponent of sustainable development, two of our upcoming projects have been earmarked to be Green Building Index-compliant," its director of property division (north) S. Rajoo said. They are the 0.8ha "Brook Residences" high-end bungalow development adjacent to the affluent Jesselton area and the "Ara Setia", a 12ha mixed development in Sungai Ara. The property scene in Penang looks promising, according to a report by CIMB Research. One of the highlights of the November 5 2009 report titled "Pounding the Pavement in Penang" was the potential property development projects by the state. * 160ha of hill land with elevation of 250-1,700 feet perched on the Relau/Paya Terubong Hill. "The Penang state government plans to invite proposals for the development of these five parcels of land," said CIMB. "We understand that big developers are showing keen interest in some of the strategically located landbank, particularly the Bayan Mutiara and Gurney Drive Offshore projects," it added. Noting that although the Batu Kawan land is sizeable and well-located, the report said the soil is swampy and difficult to develop. "We view favourably the participation of the big developers in these projects as it will not only help accelerate development of Penang but could also be a significant share price catalyst if pricing is fair." For Penang-based property player MTT Properties and Development Sdn Bhd, its garden township development called "Botanica CT" in Balik Pulau, is set to make waves when the first full-boarding international school comes up. The school, which will offer the British curriculum system, will have the infrastructure to house 800 students and the first enrolment is planned for September 2011. Ivory Properties Group, which is planning an initial public offering, also has several condominium and landed property projects lined up, along with a tourist mall. CIMB also said that feedback from developers on what it is like operating under the Pakatan state government compared to before was that the new officials are working hard but need time to move up the learning curve. "Also, the civil service remains relatively unchanged and, therefore, both sides need to cooperate better to facilitate speedier processing. Certainly, hidden monetary costs are minimal but the trade-off is more bureaucracy and slower approvals. "The slower approvals contributed to delays in launches and construction progress, which in turn partly explains the firmer-than-expected property prices in the state," said CIMB. The Emkay group of companies, controlled by property tycoon Tan Sri Mustapha Kamal Abu Bakar, has secured a RM120 million loan from RHB Islamic Bank Bhd to finance its green development project in Cyberjaya, Selangor. The deal, entered via Joyful Gateway Sdn Bhd - a joint venture company between MKN Embassy Development Sdn Bhd and partner Lucky Cottage Sdn Bhd, is for the construction of the Shell Shared Service Centre. MKN Embassy is a 60:40 partnership between Emkay Group and Bangalore's Embassy Group. The project, financed through RHB Islamic's Istisna Ijarah term financing is expected to be completed by early 2011. Total estimated construction and related cost of the new building is RM151.4 million, which houses five levels of office space and three levels of sub-basement parking lots. It will be the first in Malaysia to have the Leadership in Energy and Environment Design (LEED) gold certification. It will also be the first green building for Cyberjaya. LEED is a US-standard green rating given by the US Green Building Council. Speaking at the signing ceremony in Cyberjaya yesterday, RHB Banking group managing director Datuk Tajuddin Atan said RHB Islamic recognises the potential of green technology in reviving the state of the economy and the environment. "We are delighted to be part of this green project. With Joyful Gateway's support from its parent company, Emkay Group, and the global presence of the Shell Group, we are optimistic this project will be a success," he said. The agreement was witnessed by former prime minister Tun Dr Mahathir Mohamad, Mustapha Kamal and Embassy Group of India chairman Jitendra Mohandas Zirwani. 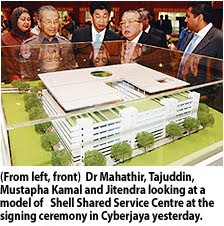 Shell Shared Service Centre Sdn Bhd will lease the building with 323,000 sq ft of office space for 10 years, with the option to extend another five years starting 2011. The new centre will enable Shell to centralise its businesses and service centres in the Klang Valley to only two premises from the current 10 locations. Its other centre will be located at the Kuala Lumpur Sentral in Brickfields, which is set to be ready by late 2012. CYBERJAYA: The Emkay Group, via a joint venture called Joyful Gateway Sdn Bhd, has secured Islamic term financing worth RM120mil from RHB Islamic Bank Bhd to pay for the construction of an office building in Cyberjaya. The construction cost was estimated at RM151.4mil, according to a joint statement issued yesterday by RHB and Emkay Group. The building, when completed, would be leased to Shell Shared Service Centre for 10 years, with an option to extend for another five years. Project developer Joyful Gateway is a joint venture between Emkay’s MKN Embassy Development Sdn Bhd and Lucky Cottage Sdn Bhd. “With Joyful Gateway’s support from its parent company Emkay Group, and the global presence of the Shell Group, we are optimistic that this project will be a success,” RHB Banking Group manging director Datuk Tajuddin Atan said in the statement. The 323,00 sq ft “built-to-suite facility” will upon completion be the first building to be accredited with the internationally recognised LEED Gold certification and be the first Green Building in Cyberjaya. PETALING JAYA: Developers and construction players are generally, in favour of several mega property projects in the pipeline in Kuala Lumpur, especially the proposed development of a multi billion ringgit 100-storey skycraper, expected to be built near Matrade Centre, bordering Jalan Kuching and Jalan Duta. Master Builders Association of Malaysia (MBAM) president Ng Kee Leen said the mega projects would help spur the Malaysian economy further and provide more jobs to players in the industry. Occupying a 28-ha site owned by Permodalan Nasional Bhd (PNB), the project could be completed in three to five years, if approved. “It’s definitely the right time to revive the construction industry in a big way as (prices of) raw materials for the construction industry have stabilised and more importantly, consumer confidence, both local and foreign, is rising,” Ng told StarBiz yesterday. Kuala Lumpur City Hall had approved several 30-storey and 50-storey property developement projects in the city, which are expected to commence soon. Kuala Lumpur City Hall and top officials from PNB were unavailable for comments on the mega projects or confirm if the proposed100-storey skyscraper project had been approved. Ng said despite the current property overhang, there were signs of a revival in the construction industry. “There is now more hiring of draftsmen and architects and if most of the mega projects are appproved, it would certainly help further boost the Malaysian economy,” he said. “It would show to the world the Malaysia’s seriousness in following through with its plans,” he said, citing the continued property developments in Hong Kong and Singapore despite the current property overhang. Jack Chua, a local real estate property agent and a property consultant specialising in property in the Golden Triangle area, said the impact of new mega projects would overall be positive to the economy. “We believe if Malaysian government policies remain consistent and attractive, there should still be good buying interest from locals and foreigners, even if more mega projects come onstream,” he said. Meanwhile, a local property analyst said while government policies had generally been proactive and supportive of the construction industry’s growth, the recent re-introduction of the real estate property gains tax (RPGT) did not go well with players in the industry. “Many of them felt that the RPGT came very suddenly, just when the construction industry was showing signs of recovery,” he said. The analyst said many construction players, including associations like MBAM and Real Estate and Housing Developers Association, had urged the Government to reconsider deferring the RPGT to a more appropriate time. ALOR SETAR: The Kedah government has deferred the implementation of the 50% bumiputra quota policy for new housing schemes. The decision was made because some parties are not happy with the proposed policy. Housing and Local Government Committee chairman Datuk Phah rolrazi Zawawi said the state government did not want people to be unhappy with any of its policies. “We do not want people to claim that a policy is unfair and only favours one group. We will find a more amicable solution,” he told reporters at Wisma Darul Aman here yesterday. The policy was supposed to have been in place by Sept 1. Phahrolrazi explained that the requirement was meant for Malay reserve land that had been converted to freehold status so all races could buy and stay in such housing schemes to avoid racial polarisation. He said this was because most new housing schemes tended to be occupied exclusively by certain races. Phahrolrazi said the quota was also set to enable all Kedahans to buy affordable homes. “Most importantly, the state government wants to ensure that those staying on Malay reserve land can have their own houses when the status of the land is converted. “But we are going to make sure that any such conversion is only carried out when necessary,” he said. Mentri Besar Datuk Seri Azizan Abdul Razak, who announced the policy some time back, had said then the policy was made because Malays made up 1.5 million of the state’s 1.9 million population. The announcement of the new policy came under fire from NGOs, politicians and developers, with Pakatan Rakyat coalition partner DAP being the most vociferous in its protests. In Alor Setar, the Kedah Gerakan Youth lauded the state government for putting the policy on hold. Its chief Tan Keng Liang said in a statement yesterday that although it took more than a year for the PAS-led government to realise the irrationality of the policy, any further delay in cancelling the policy would cause further damage to the local housing industry.